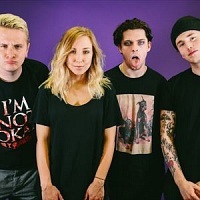 Milk Teeth are a British punk rock band from Stroud, formed in 2013. The band features singer/ bass player Becky Blomfield, plus Chris Webb - guitar, Billy Hutton - vocals/ guitar and drummer Oli Holbrook. They released their debut album, "Vile Child" in 2016.